And of course, I do travel for the food. Having lived with a Chinese-Burmese family for 2 years, I am fortunate enough to try both traditional Burmese and Chinese-Burmese dishes, which in general have bold and strong flavors from the use of different spices as well as preserved vegetables and fruits. As familiar as I was with the taste, savoring the cuisine at its origin was definitely something exciting that promised a lot of delights on the way. Delight no. 1: Milk tea! Why has nobody told me about the milk tea? It blew my mind the first time I tried and this second time coming back all I wanted to do was drink more wishing I could store it on my taste bud and retrieve it whenever I want to. I’m telling ya, it’s a taste of heaven. As someone who likes coffee and tea a little rich and milky, the Burmese milk tea (laphat yay) is just right for me. 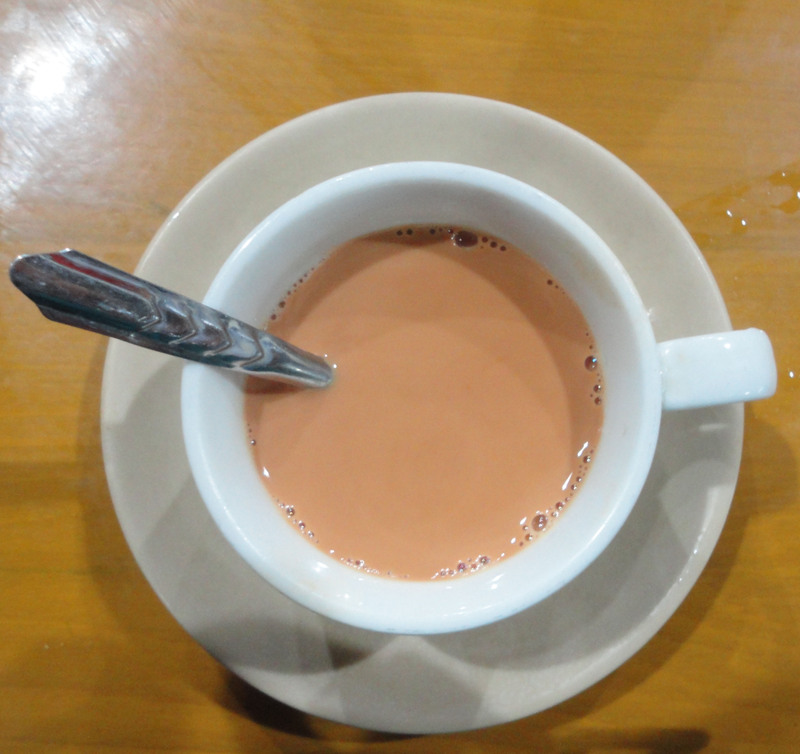 It does not have an aroma like teh tarik or vibrant color like Thai milk tea, but in just one sip you can feel both the mild bitterness of tea and the richness of evaporated milk. Laphat yay comes in 3 variations: bitter (kya saint), normal (pon mhan) and sweet (pot saint) (I myself prefer the most bitter of all for its aftertaste). I love to scoop a spoonful of tea and let it run down back to the cup, feeling the rich texture with my eye and then take a sip (wine connoisseurs have their way of appreciating wine, and so do I of savoring tea). Nothing fancy, just tea, sugar and evaporated milk, but what differentiates one shop from another is the ‘secret’ ratio of tea to milk. And in a country where there is a tea shop almost at every corner of the street, differentiation does matter. 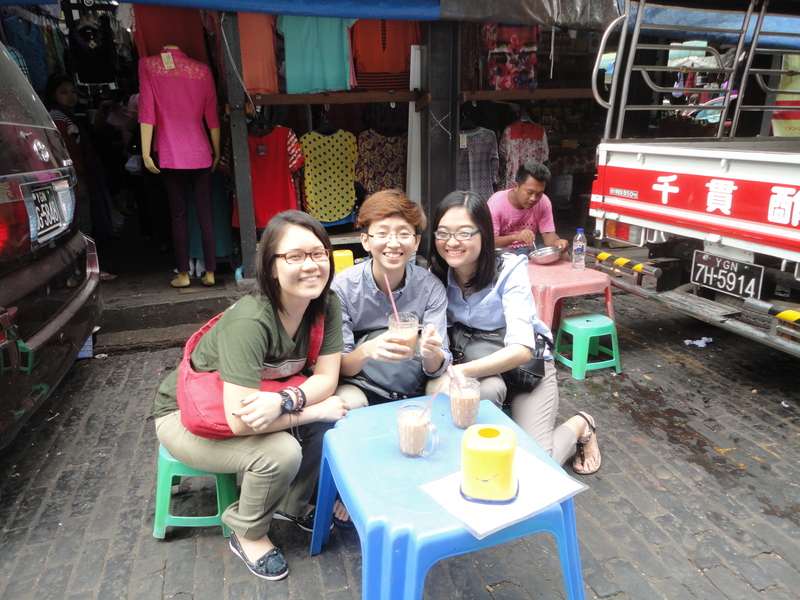 Trust me, milk tea is better in these makeshift shops than in restaurants. Coffee to Vietnam is tea to Myanmar: you haven’t truly visited Myanmar if you haven’t found yourself sipping tea at a street corner either alone watching people and cars passing by or in a group chitchatting with your friends. 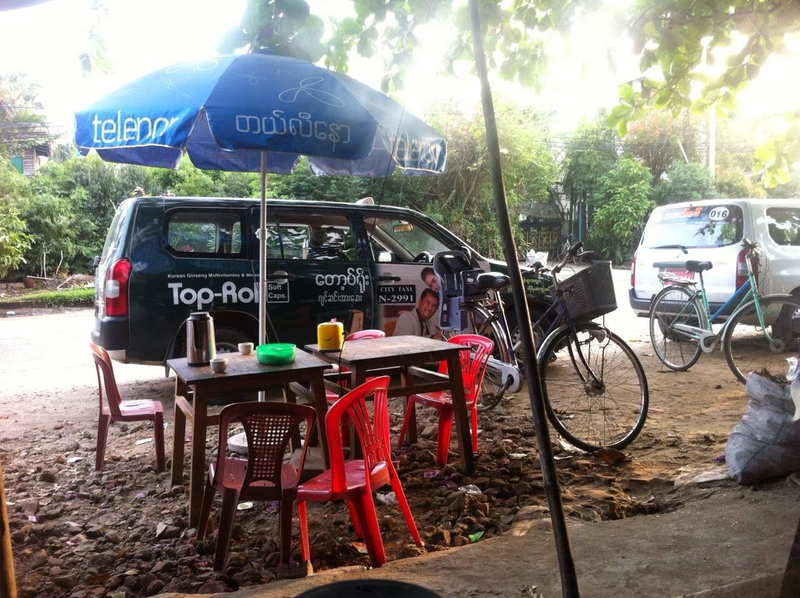 A Vietnamese will liken it to sitting at Hàn Thuyên street enjoying their cup of coffee and all sorts of street foods. Nothing spectacular about the sight, just pedestrians, lots of motorbikes and occasionally you will inhale smoke from old vans moving past, but it has somehow become a part of the city life. The humble tea and coffee has become a binding agent in those lively conversations with friends as well as a stimulant for one’s brain when they just need to be quiet and dwell on their own thoughts. Delight no. 2: Street food! I could go on and on here, but I know you will need time to savor laphat yay in your mind and check your calendar for the next holiday to Myanmar. I’d better pause. Next > From itchy feet to a happy stomach – Myanmar – Part II: Street Food!